It was confirmed today 31st May 2017, that The £55 million regeneration scheme for Westside in Wolverhampton will start in 2018. This past 12 months, has seen Heantun House and the old indoor market knocked down to pave the way for the new development. The overall project will cover land between Penn Road Island and Salop Street, including the current School Street and Peel Street car parks and the area around the new Market Square. A new location – A new lease of life? Now if you are a long standing old Wulfrunian like me. I am sure you will have a feeling of having already experienced this present situation before. In my lifetime spent in the town of my birth, I have witnessed many clearances and re-builds some twice over as with this latest scheme. I regret to say though, in my opinion, this latest development in Wolverhampton will prove the end of its Market which throughout the town’s recorded history, has been the very institution that oversaw its growth and prosperity and became the focal point around which the lives of its people have revolved. Let me take you on a journey into the past some 700 odd years. There is a reason to believe that a market was already in existence at “Wulfrun Heantun”, as the town was then known, in the year 1180. But it was not until 1258 that marketing in Wolverhampton was put on a proper legal footing. In that year at Westminster, King Henry the III granted a charter to Giles de Erdington, Dean of Wolverhampton, to hold a weekly market. To take place each Wednesday and a yearly 8-days’ fair on the eve of the Apostles St Peter and St Paul, and the six days following. Over the years the area designated for the Market Place was High Green and its nearby streets. Then In 1848 Wolverhampton was granted a Charter of Incorporation. as a Borough. They quickly elected a Town Council who soon realised there was a need for a new General Market Hall. This new Building to accommodate the many stallholders was erected on the West facing side of St Peter’s Church adjoining North Street and Cheapside and opened in March 1853. In 1953 the Retail market celebrated its centenary, arguably the busiest place in town in those days on a Saturday. But never the less, The Council who had for years harbored the idea of a Civic Centre on a site close to the church and the Town Hall, thought this spot was wasted on the market and would be an ideal location to build a more central local government area. So they formed a Reconstruction Committee to consider the Towns future Development and they finally expressed the view that the 100-year-old, Market Hall, had “passed its useful structural life. With the approval of this opinion by the Council, plans were made for a new Market Hall on a site known as Brickkiln Croft. 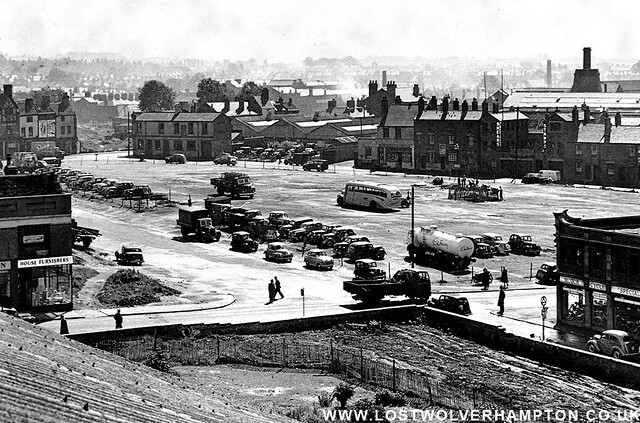 So in 1957, work began on the new Salop Street, School Street market. A development that would contain shops, offices, and both indoor and outside markets. Unique in its day was the huge underground car park and storage facility, the one major improvement on the smelly rat infested vaults of the original market. The new market was eventually completed and opened by Lord Morrison, in 1960, at a cost more than half a million pounds. And in 1961 the old retail market in Cheapside was demolished. Of all the buildings that have gone from my youth, I regret the loss of this grand Victorian edifice most. Looking down across the roof of the Odeon Cinema, Skinner Street, across Salop Street to Brickkiln Patch, long time home of Pat Collins Fair, and the site for numerous Travelling Circuses. The West End Public House on the corner in Brickkiln Street seen in 1954. Starts the run of small businesses at that time in Peel Street, that provide the backdrop to the former Brickkiln Croft. The site was chosen for the erection of the new retail market. For many years it was full of small courts of terraced houses, bordered by Brickkiln Street, Peel Street, Bennetts’ Fold and Salop Street. The corner showroom’s on the right belonged to George Lathe, a Motor Cycle dealer and well-known figure in the early pioneering days, of the motor bike in Wolverhampton. In the foreground opposite, was until 1952 occupied by the Ragged School, a school opened in 1848, originally on a site in the Carribee Island district of Stafford street. This school built in the first instance for the destitute, and taught by generous volunteers, moved to this site on the corner of Salop, and School Street, via another site in Princes Alley and survived for over 100yrs. This whole area would provide grim news in 1934. 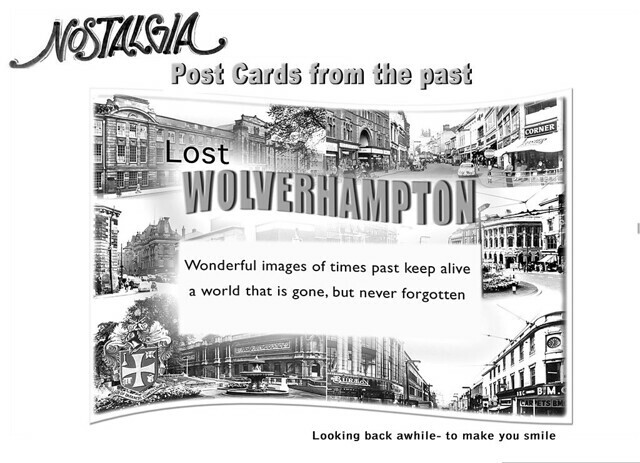 When – the Express & Star stated that Wolverhampton had become a town of terror. The “Peel Street Monster” was roaming the Brick kiln Street area attacking children, and it had sprung up and attempted to bite the throat of one pursuer. It was eventually cornered and crushed with a brick. Hundreds of people gathered in Salop Street to watch council workers, trying to verify if there were more of these creatures about. The would-be monster was later identified as a coati-mundi, a raccoon type animal from South America, how it got to Wolverhampton is still a mystery. Sad to see the past disappearing Billy. Thats life today I’m afraid Diane. I suppose that times are forever changing and we have to adapt to them. I don’t dwell on this changes anymore I just recall those magic moments.